In this WWGOA GOLD LIVE event, George Vondriska demonstrates how to turn your bandsaw into a dovetail machine. With a little practice and a simple shop-made jig, you’ll be cutting through dovetails on your bandsaw in no time. Learn more about lock rabbets on your router table with George Vondriska during this WWGOA GOLD LIVE event. This WWGOA GOLD LIVE event is all about the router table, cope and stile joints. George Vondriska used a two-piece rail and stile set and shop-made coping sled, while sharing lots of door making secrets along the way, to help you produce perfect cope and stile joints for your next door project. 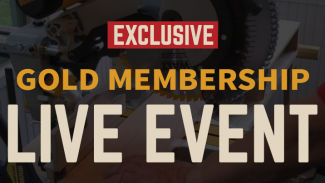 In this WWGOA GOLD LIVE event, George Vondriska demonstrates the best way to cut perfect dadoes and rabbets using a table saw.